This year a team of six University of Notre Dame students with funding, coaching, and support from the Eck Institute for Global Health traveled to Atlanta to compete in the 11th Annual International Emory Global Health Case Competition. The competition is a unique opportunity for graduate and undergraduate students from 30 universities, in the US and international, to come together to promote awareness of and develop innovative solutions for 21st Century global health challenges. While the competition uses a similar format as a business school case competition, it is unique in its requirement for students to work in multidisciplinary teams to analyze and present a solution for a current global health issue. This year’s Notre Dame team truly exemplified the multidisciplinary nature of the competition. 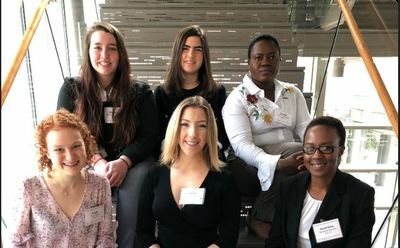 The team composed of Henriette Uwimpuhwe Balinda, a PhD student in Biological Sciences, Mariana Suarez ’21, Science-Computing, Dorcas Omowole, Master of Global Affairs 2019 candidate, Madeline Woodruff, Master of Science in Global Health 2019 candidate, Annie Foley ’22, Anthropology, and Lauren English ’21, Neuroscience. On March 9, while most students were beginning their Spring Break, Emory released this year’s case titled, “Implementing Innovative Hurricane Disaster Preparedness Strategies in a Changing Global Climate.” After a week of researching interventions, speaking with subject matter experts, and brainstorming, the team traveled to Emory University to present their proposal. In order to select students to represent the University of Notre Dame at Emory, the Eck Institute for Global Health hosted an internal competition on Saturday, February 9, 2019. Five teams were charged with developing strategies to increase HIV medication adherence in St. Joseph County Indiana. This program has been a phenomenal way to engage undergraduate and graduate students in global health training outside of the traditional classroom and across disciplines. The Eck Institute for Global Health serves as a university-wide enterprise that recognizes health as a fundamental human right and works to promote research, training, and service to advance health standards and reduce health disparities for all. The Institute brings together multidisciplinary teams to understand and address health challenges that disproportionately affect the poor and to train the next generation of global health leaders. Originally published by Ashley Hudson at globalhealth.nd.edu on April 09, 2019.